This explanation was necessarily disingenuous. Furtwangler was not the sort of man to trade anecdotes at Manhattan dinner parties. His lapdog analogy plainly questioned the influence of affluent non-musicians in musical affairs. In a recent blog I called the Philadelphia Orchestra’s decision to replace Leopold Stokowski with Eugene Ormandy “one of the most parochial blunders in the institutional history of classical music in America.” Was the Philadelphia Orchestra a Luxushund? The incongruous 44-year phenomenon (1936 to 1980) of a middling conductor taking over from a galvanic genius remains mysterious. Certainly (as I earlier speculated) the music businessmen Charles O’Connell and Arthur Judson had input into Philadelphia’s decision to hire Ormandy over such readily available refugee candidates as Erich Kleiber and Otto Klemperer – not to mention Fritz Reiner, who next door at the Curtis Institute coveted the Philadelphia podium. O’Connell superintended the classical music division of RCA Records. Judson was for decades the presiding powerbroker – the Robert Moses – of classical music in the US. He ran the New York Philharmonic and (for a time) the Philadelphia Orchestra. He created Columbia Artists — the most powerful booking agency for conductors and instrumentalists. One of the Philharmonic’s most important American premieres was of Mahler’s Sixth, under Dimitri Mitropoulos in 1947. But the Philharmonic balked at scheduling the work on the Sunday afternoon broadcast concert — Judson maintained that Gershwin’s Piano Concerto in F would be more suitable national radio fare and would also sell more tickets at home. In response, Mitropoulos wrote Judson (October 14, 1947) “to beg you, almost on my knees” to change his mind. “It would be a crime not to give this New World [broadcast] premiere of this great and exciting symphony . . . It would be a great event from which we have nothing to fear and from which to expect no less than the highest gratitude of all the musical artistic world in the United States.” He added that he awaited Judson’s response “with anxiety.” Judson said no. Samaroff (born Lucy Hickenlooper) was a prominent American pianist and pedagogue. She was also Leopold Stokowski’s first wife, and backstage played a decisive role both molding his exotic public persona and promoting his glamorous musical career. Her letter to Bok self-evidently conceals a back story – a web of negotiation impossible to extrapolate. But its surface content is wholly engrossing. Well, Samaroff was wrong about Reiner. Certainly Furtwangler and Klemperer were harder “to get on with personally” than Ormandy would be. Was Kleiber “not big enough.”? He today looms a lot bigger than Ormandy. What is more: In Berlin, it was he who led the world premiere of Berg’s Wozzeck in 1925, a brave and triumphant undertaking. As a guest with the New York Philharmonic in 1930 and 1931, Kleiber programed Mahler, Hindemith, Berg (excerpts from Wozzeck and Lulu both), Krenek, Toch, and Malipiero. Klemperer’s New York Philharmonic programs included Berg, Bruckner, Hindemith, Janacek, Mahler, Schoenberg, and Shostakovich. Even Furtwangler, whose repertoire predilections were conservative, in 1925 led the Philharmonic in its first performances of The Rite of Spring. “Although Ormandy has become one of my personal friends I had formed my musical opinion of him when I did not know him from Adam. I went to a concert of the Philadelphia Orchestra when I knew nothing of him musically or personally. I was overwhelmed by the display of qualities that were so like the young Leopold that it was uncanny. 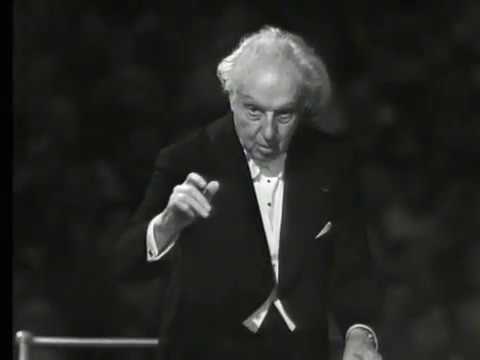 I am not speaking of externals of conducting that might be imitative of Stokowski’s methods. I am speaking of purely musical and temperamental qualities, of phrasing, feeling and orchestral balance . . . As a man I do not yet know him very well but I have already had occasion to discover one priceless quality – loyalty. . . . I realize there are readers who will agree with Olga here – when Norman Lebrecht reproduced my previous Ormandy/O’Connell blog on slippedisc, the respondents included Ormandy enthusiasts. Without getting into a shouting match, I will add that I heard Ormandy in live performance at the Academy of Music a few times in the late 1960s. I will agree that his live performances surpass his studio recordings. (I also found the sound upstairs quite decent, however notoriously dry the downstairs acoustic of the Academy may be.) I liked best a reading of the Mussorgsky/Ravel Pictures at an Exhibition. The smooth skin of the Ormandy sound cushioned the bite of Mussorgsky’s characterizations and (in the case of the feuding Jews Goldenberg and Schmuyle) caricatures. But the sonic refulgence of the “Great Gate at Kiev” was undeniable. I pick this particular piece to make a point because it so happens that Koussevitzky commissioned and premiered Ravel’s orchestration of Pictures at an Exhibition – no small achievement — in Paris in 1922. That’s a fundamental difference between Ormandy and such intrepid culture-bearers as Stokowski and Koussevitzky. Koussevitzky’s proudest achievement was Tanglewood – he created it as a laboratory for American music and American composers. The list of important Koussevitzky commissions and premieres is long. As for Stokowski, the composers he historically championed ranged from Schoenberg to Rachmaninoff to Varese (think about that). He led his own Youth Concerts and his own Young People’s Concerts (including one in which he produced a live baby elephant for Saint-Saens’ Carnival of the Animals). Arthur Judson notwithstanding, Koussevitzky and Stokowski shaped taste. Wilhelm Furtwangler notwithstanding, their American orchestras were not lapdogs. P.S. : Curtis Bok resigned as President of the Philadelphia Orchestra board on Dec. 11, 1934 – three days after Samaroff’s letter — in protest against the board’s ouster of Stokowski. His mother, Mary Louise Curtis Bok, did the same. Though Stokowski came back, and the Boks did not, Samaroff’s counsel presumably remained pertinent when in 1941 Stokowski left Philadelphia for good and Ormandy became sole music director. However one reckons the magnanimity of the Boks and other Philadelphia philanthropists, and their influence on the affairs of the Philadelphia Orchestra and Curtis Institute (the Mary Louise Curtis Bok Foundation invaluably supports Curtis to this day), the most colossal of all American musical philanthropists was Henry Higginson. He invented, owned, and operated the Boston Symphony. He also built Boston’s Symphony Hall. It greatly mattered that Higginson (while a banker) was a Vienna-trained musician. He had taste, he had ears, he had exceptional scouts abroad. Personal amenability was self-evidently not a high criterion for prospective Boston Symphony conductors. Nor was Higginson impressed by great reputations. He was after talent. He hired Artur Nikisch before Nikisch became Germany’s pre-eminent symphonic conductor. He settled on Karl Muck, a powerful leader who in wartime betrayed him and broke his heart. I would additionally call Higginson a great man; he fits no categories for cultural benefaction. For the singular story of Higginson and the BSO, see my Classical Music in America: A History of Its Rise and Fall (2005). For a full Higginson portrait, see my Moral Fire: Musical Portraits from America’s Fin-de-Siecle (2012). Thanks for this. Very well done. When I started hearing Ormandy and the Philadelphians at Saratoga in 1966 I could not believe the ravishing sound of the Orchestra — just as I couldn’t believe the sound of the Orchestra at the Academy of Music under Sawallisch in April 1984, in my first trip to Philly. 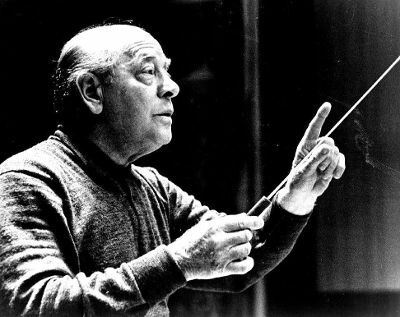 Ormandy made some excellent recordings, and he thoroughly deserved the tribute he got at Carnegie Hall in November 1965 when he gave his still-unequalled performance of Mahler’s Tenth Symphony in the superior first version by Deryck Cooke. He also made a superb recording in 1947 of Debussy’s Damoiselle Elue with Bidu Sayao and Rosalind Nadell that is still unmatched except by Toscanini’s 1940 broadcast with the NBC Symphony. Was he Stokowski? Of course not. But he did make his mark. and ultimately powerful media brokers like David Sarnoff and Arthur Judson. had heard Ormandy many, many times in the Academy of Music and am quite expert as to his discography. If Mr. Horowitz would care to engage in a true Socratic dialogue on this score, I’d be delighted to oblige him. is almost insuperable in much of the repertoire of the late 19th and 20th Centuries. and even Beethoven. Pity that preconceived theses get in the way of a true musical communion. So he’s not my fave, but he was good for his times and did a nice job keeping the orchestra in the classical spotlight. Post-HIPP, now that bands are expected to play Baroque music with the appropriate dash and still retain the ability to schmaltz the hell out of Barber and Korngold, maybe he’d not be well-suited. Still, I’m rather fond of him although I do prefer the current baton-wielder at the helm, along with the occasional drive-by from Vladimir Jurowsky to spice things up a bit. avoids replying to the substance of my comments on Eugene Ormandy. One doesn’t preclude the other, Mr. Cooke: expertise in one’s field vs. an avocation. for expertise I rarely can discern), I felt it was necessary to invoke my background. The professor, Dr. (as he seems to emphasize) Joseph A. DiLuzio, certainly has very his own high-minded opinions (in his view, incontrovertible positions) about music. It’s much akin to a music “professor” having similar opinions about English and Italian.